I’m back! 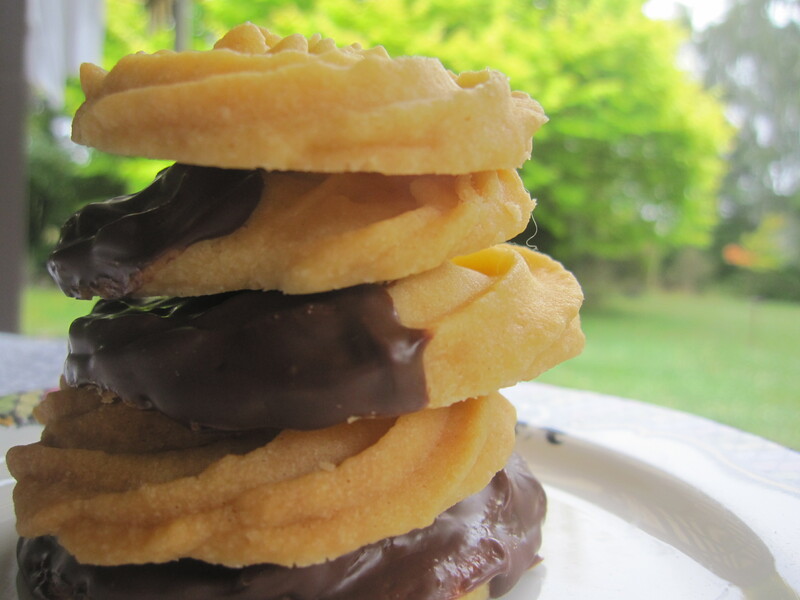 Finally, a little later than expected, and with – unfortunatly – no baking to share other than my own. Nevermind. What else is new with me? Well, as of last week I’ve applied for two jobs. One is food preparation early Saturday and Sunday morning’s at the local shop, the other (please please please may I get this one) is at a European bakery. If I get either I’ll be incredibly happy. School starts again on Wednesday – I guess it had to happen sometime, right? As for me baking, it’s been practically non existent for the past few weeks. It was mum’s birthday on Friday, which ment we had shop bought cake (read: YUM.) plus apple pie, plus a whole jar of lollies and chocolates from when we went away. There is literally no room in our kitchen for me now. Haha. 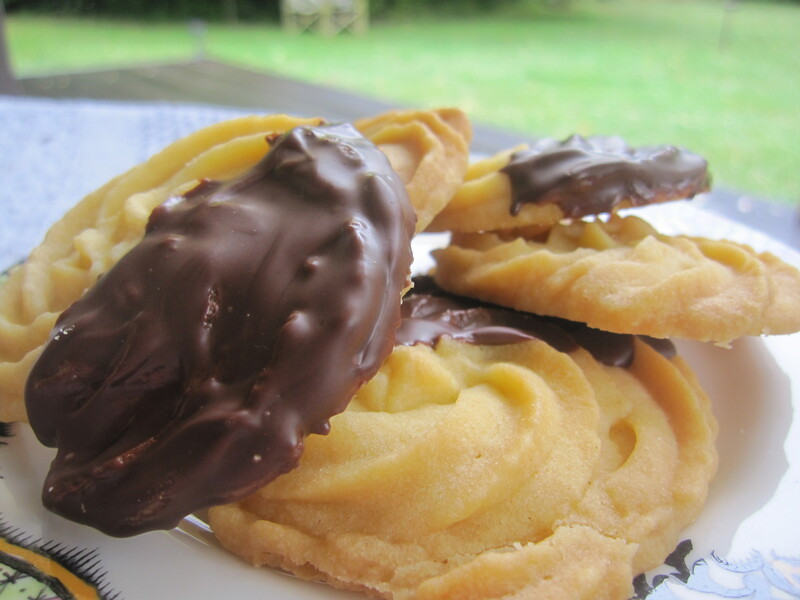 With that being said – I still made space for these delicious delights – chocolate dipped whipped shortbread – what a mouthful! The secret is simply, whip, whip, whip! If you whip effectivly, you are guaranteed a delicious light, buttery, melting yet dense mouthful everytime. There is deffinatly room for these in every kitchen – and tummy! Have a great week everyone – happy baking! (7) (time to get the cookies onto your baking sheets) Drop by teaspoonfuls or use a cookie press or pipe cookies onto the parchment lined baking sheets. I think one of the nicest things about Christmas is the fact that it’s an excuse to tell everyone who you appreciate – just how much you appreciate them. There’s nothing more rewarding than giving something home made, and watching the joy unfold on the person’s face – priceless. That’s exactly what I decided to do this year. 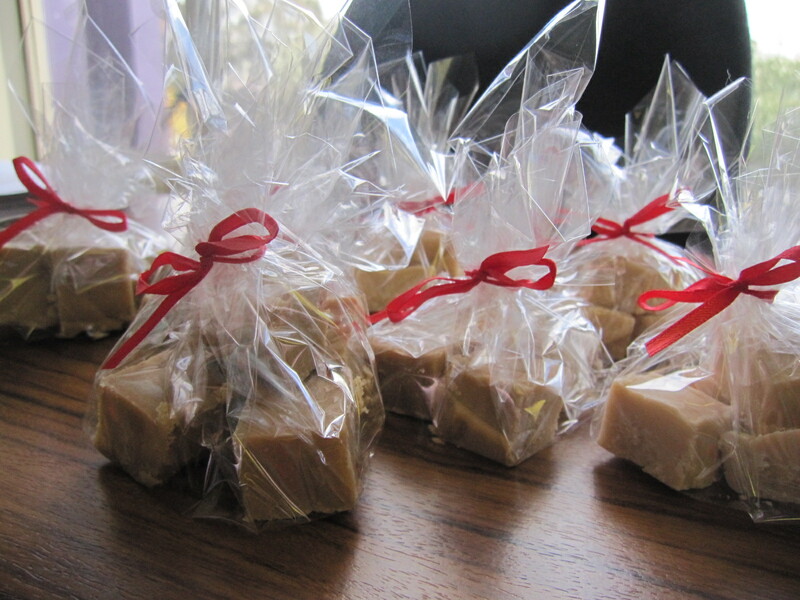 For all my teachers at school, I made fudge (I also made some lovely shortbread, but I didn’t get any decent photographs) and bagged it with some ribbon. There were leftovers, so out of generosity of the season, I handed them out to people at mum’s work – plus, I had a spare bag for myself. The fudge, was the most perfect fudge – and I can’t wait to share the recipe with you all. Whenever I’ve made fudge before, I’ve always used condensed milk in any attempt to get a result I have liked – which has never worked. This fudge, is made with cream, brown sugar and maple syrup (yes, que drool). It’s boiled and then whipped (good for muscle building), which gives it a beautiful smooth – although slightly gritty – melt in your mouth fudge. Just the way I like it, the way fudge should be. I also made some white chocolate cream fudge (which is acctually the first picture) – using the same method, but with white chocolate. It was equally as scrumptious. Add the two sugars, butter and cream, maple syrup and salt into a sauce pan. Place over medium heat. Stir while bringing to a boil. Lower the heat and continue to stir slowly while the mixture cooks. After about 7 minutes, test by pouring a small amount into some cold water. You want it to form a soft ball. You might need to cook it for another minute or two. Remove from the heat, add a couple of teaspoons of vanilla and start stirring. It takes about 14 or 15 minutes for the fudge to cool and thicken. Pour into buttered dish. TIP: If you let the fudge sit for 10 minutes after removing from the heat and allow it to cool slightly this will reduce the stirring time.